Sometimes I come up with an idea I think is good - and then I learn that someone really smart said it first!!! Moments like that are so exciting for me, because, you know, they make me feel smart! Well, this happened recently when I discovered John Taylor Gatto's book, Weapons of Mass Instruction. First, I'll tell you about another little book that introduced me to Mr. Gatto. It's called Your Children Can Change the World, by Ginny Seuffert. It is a tiny book written for Catholic homeschoolers that presents the 14 principles Gatto identified that distinguish the elite, expensive education sold to "future leaders" from that proffered, free of charge, by the U.S. government to the worker/consumer class (i.e. the rest of us). Seuffert explains their value and suggests how they can be implemented in a homeschool setting. I recommend book - because it's good, practical, encouraging and takes little time to read. And, it will make you want to know more about John Taylor Gatto and his ideas. He even wrote the complimentary introduction. 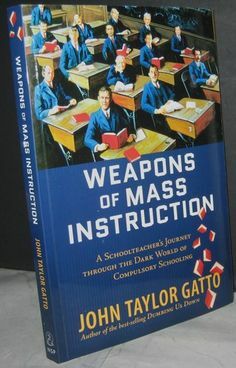 In Weapons of Mass Instruction, Gatto shows that not only have we been sold a way of thinking that doesn't get us anywhere, but that it has been done deliberately. Most of us went to school and were reminded that we should get good grades so that we can get into a good college. We should get into a good college so that we can get a good job. We should get a good job so that we can buy a house, a car and all the stuff, send our kids to college and retire. It's a conveyor belt toward virtual slavery to invisible others. When we "get a job," we work for someone else who is probably making more than we are through our efforts - our daily, weekly, yearly efforts. What we do take home, we put into a house - that really belongs more to a bank(er) than it does to us - for thirty years. During our evenings and weekends off, we relax by watching TV shows, in themselves of mixed value, and told during the commercial breaks what we ought to buy! So we do! However much I might love my job, I am replaceable. Should I leave, "Human Resources" will just go out to the conveyor belt and get another cog that will just as easily fit into the gears as I do. Fresh out of college I did some substitute teaching. Being on the other side of the desk for the first time, I observed that what scools largely do is to teach kids not to take initiative, nor to be creative and curious. They must raise their hand to ask permission to do the most basic tasks (like sharpening the pencil they need to use to finish thier assignment and even use the bathroom). I know, I know, classroom order. I don't think it's necessary. When Britney raised her hand to let me know she had finished the quiet assignment they were all working on and what should she do now, it was immediately apparent that, she wanted the class to know she had finished it before anyone else and that she needed permission to move on to the next task. She even knew that the obvious things to do were to work on her homework or read quietly when I asked her what she thought would be an appropriate thing to do. I got my first lesson in what classrooms across America are really all about - control of the student (future citizen workers). Even teachers are not really aware of this, as they are a low part of the system - and many of them are doing a fine job to undermine it by really teaching kids to learn, as John Taylor Gatto did while he was still teaching in the government schools in New York City. Gatto's book is well written (at least it came across as intelligent and cogent in an audio format) and gripping. He presents anecdotes from his own experience teaching in New York city public schools, of others' successes without schooling, documentary and historical evidence that the dumbing down of the American citizenry has been intentionally orchestrated since about the time of the Civil War! I'd probably add a quote from the book at this point - but I listened to it, so you'll just have to take my word for it! Whether you're homeschooling your own children, trying to offer your classroom students the best shot at life or are a conspiracy theorist, you'll find something to love and something to learn in Weapons of Mass Instruction.